18 x 5 x 8 in. Betty Cuningham Gallery is pleased to announce an exhibition of paintings, sculpture and collage by David Bates. A recent addition to the gallery’s roster, Bates will be having his first exhibition at the gallery. The artist will be present for an opening reception on Thursday, October 20 and the exhibition will remain on view through Saturday, December 3, 2011. While much of Bates’ previous work has focused on widespread themes, such as the Gulf Coast or the devastating effects of Hurricane Katrina, his recent work focuses on objects and people directly involved in the artist’s personal world. “I make art of the things I know,” Bates claims. For example, the chairs, ladder-back or wing, resemble furniture in the artist’s home. They are repeated throughout the exhibition, either as a vessel to contain the subjects of his portraits or as the sole subject, realized in collage, oil paint and bronze. Similarly, the objects included in Bates’ monumental still lifes- whether it be the precisely arranged flowers or the items strewn atop tables- all are intimately connected to the artist in some manner. Born in Dallas, TX, David Bates received a B.F.A from Southern Methodist University in 1975. Bates then attended the Whitney Museum of American Art’s Independent Study Program before returning to his alma mater to receive his M.F.A. in 1978. After graduation Bates began receiving national recognition, exhibiting in museums across the country. In 1987, Bates’ work was chosen for the Whitney Museum of American Art’s Biennial Exhibition. 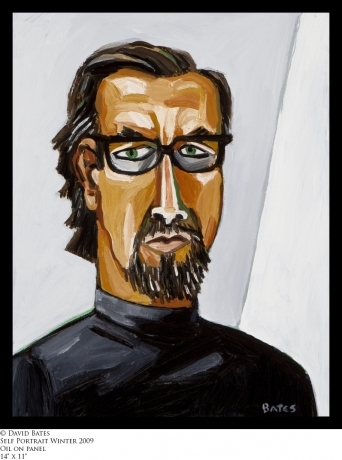 Most recently in 2010-2011 Bates was featured in a solo-exhibition, David Bates, The Katrina Paintings, originating at the Kemper Museum of Contemporary Art and traveling to the Knoxville Museum of Art. Throughout his career, his work has been acquired by prestigious museums including the Metropolitan Museum of Art, New York, New York; Museum of Fine Arts, Boston, Massachusetts; Whitney Museum of American Art, New York, New York; The Phillips Collection, Washington, DC; Corcoran Gallery of Art, Washington, DC; Hirshhorn Museum and Sculpture Garden, Washington, DC; Museum of Fine Arts, Houston, Texas; Modern Art Museum of Fort Worth, Texas; The Museum of Modern Art, New York, New York and the San Francisco Museum of Modern Art, San Francisco, California. The current exhibition will remain on view through December 3, 2011.